Our versatile Berlin Gardens Poly Mission Garden Bench is an easy way to incorporate a stylish seating area in your garden, overlooking a lake or placed in your favorite outdoor area. With an iconic mission design, offered in an array of beautiful poly colors with optional Sunbrella cushions and throw pillows, you're sure to find that perfect bench that will really make a statement in your outdoor decor! 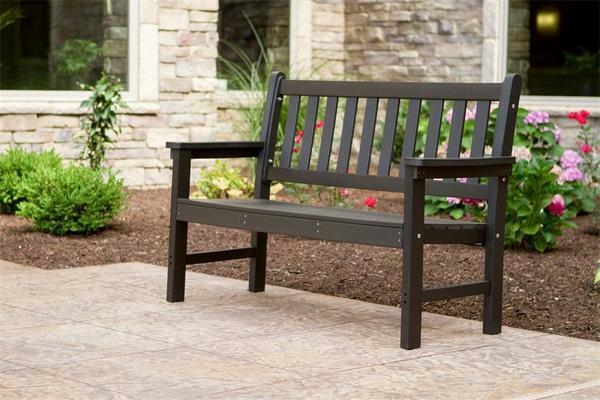 Perfect for commercial use, our Berlin Gardens Poly Lumber Mission Garden Bench will be a beautiful addition to your outdoor seating area, where you guests can easily relax and unwind while visiting your business. Seat Width - 46 1/2"
Height to Seat - 16"
Height to Arms - 25"